It's an exciting and confusing time to be a Texas A&M Aggie fan. You're pumped because your school is joining the Southeastern Conference, a league so powerful that a school that didn t even win its division in football in 2011 ended up winning the National Championship. You're in a tizzy because without longtime rival Texas on your schedule as a fellow conference member, you don't know which SEC school to dislike as much as the Longhorns. Could it be LSU? What about Alabama or Auburn? You might also have questions like: How do you get your name on a stadium in the SEC? You win 72 of 74 home games for your career, like Alabama coach Bear Bryant did in the Tide's Bryant-Denny Stadium. What causes lights to flicker in Starkville? It's when Mississippi State turns on its Davis-Wade Stadium video replay board, the fourth largest in the nation. With a board that big (112 feet wide, 48 feet high) in one of the smaller SEC stadiums (55,082 capacity), it's like having a big screen TV in a double wide. Was former Florida star Tim Tebow the first SEC quarterback ever to kneel and pray? No. Vanderbilt quarterbacks, not blessed with adequate pass protection, have been kneeling and praying for decades. 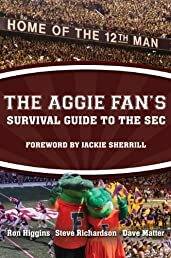 The Aggie Fan's Survival Guide to the SEC is your roadmap to winning the party, even if you don't win the game, in the nation's biggest, baddest, most competitive college athletic conference north of the equator.